The game was one of limited chances, with Fylde lining up slightly more defensively as Jordan Tunnicliffe came in for Andy Bond. Both sides had to work hard to create space, which was at a premium in a physical game. One player who often makes chances out of nothing is Nick Haughton, who again bobbed and weaved his way through the game, combining with Danny Rowe and Arthur Gnahoua. He came closest to finding the net when Gnahoua’s cross bounced kindly for him, composing himself before sending a stinging half-volley goalwards, though it was deflected behind for a corner. Haughton was t the heart of the Coasters next key chance, as his quick feet won the Coasters a free-kick after a tangle on the edge of the box. 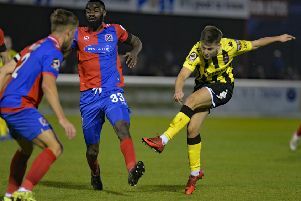 Rowe’s effort forced keeper Joel Dixon into a smart save, denying the striker a repeat of his goal at Harrogate Town on Saturday. The second half saw the Coasters start the dominant side, with Rowe executing an incisive turn and sending a shot sneaking towards the near corner of the net but Dixon was equal to it. This encouraged a period of fluency as Haughton, Gnahoua and Rowe linked up yet again, with Haughton’s eventual effort well blocked. The next chance was arguably the best moment of quality in the game, coming from wide man Gnahoua. He cut in from the wing, shimmying past two players before unleashing a ferocious effort bound for the top corner. However, Dixon saved superbly. Jason Taylor saw himself booked for his tug on Haughton, which prompted Barrow boss Ian Evatt, the fromer Blackpool favourite, into his first change as Jack Hindle was replaced by Josh Kay. Kay was instantly involved, holding up a long ball for Rhys Norrington-Davies, who in turn found John Rooney but his first-time effort found only the side-netting. Tom Brewitt stepped up from defence and picked out Haughton, who in turn fed Ryan Croasdale. He was tackled but the ball almost trickled past Dixon. The visitors had their chance to steal all three points as a long throw was headed by Neill Byrne into the back of Kyle Jameson and Lynch had to be at his nimble best to scramble across and push the ball to safety. Barrow, to their credit, neutralised Rowe’s threat effectively, forcing him wide or back into his half on occasions. This hard work was almost undone, though, when Jason Taylor’s sloppy back pass was seized on by Rowe. But twist and turn as he might, Fylde’s 18-goal top scorer couldn’t work a shooting opportunity, and the chance eventually fizzled out. The draw saw Fylde slip a spot to fourth, overtaken by Salford City as they won their top-of-the-table clash with Wrexham.